25.04.2013. 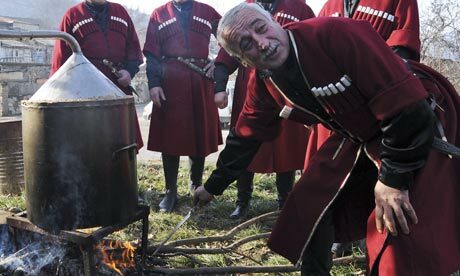 Alaverdi Monestry produces 30,000 litres of wine a year using the old qvevri method. At my table are nine people. Eight have long beards and are strictly religious. They are priests and bishops. The other is me. All of us have a glass of yellow wine and are toasting… I am not sure what. Inside the Alaverdi Monastery, in the heart of the Kakheti wine region, are bottles and bottles of wine that have been researched, studied and cultivated here since the 11th century. Bishop David stands up with the slightest of wobbles. He has engaging black eyes and a raw-boned frame. He is still youthful but this fact is disguised by a long, wispy beard. Bishop David speaks eloquently about the monastery’s history, or so I’m told. I have no understanding of the language, so snippets are translated for me. Bishop David stands at the head of the table as the ‘tamada’ (toastmaster), elected to toast and maintain discipline. This ancient ritual of host has been preserved throughout Georgian history and continues here, as Bishop David delivers a lament on wine production and the responsibility of the monastery as a wine academy. ‘Wherever there are monks, there is wine being made,’ he says. The recently excavated eighth-century cellar has been restored and the monastery produces more than 30,000 litres of wine a year under its own label using the qvevri method – which uses a large earthenware vessel to ferment wine – as well as modern methods that use stainless-steel fermentation containers. With the goal of promoting Georgia as tourist destination, the 15th International Tourism Fair and 2nd Caucasus Incentive, Business Travel and Meeting Exhibition set up a meeting place for local and foreign tour operators and enabled them to present information to an audience on April 12-14. ExpoGeorgia, an exhibition center in Tbilisi, hosted the event, uniting around 100 exhibitors from various countries including Azerbaijan, Armenia, Turkey, Thailand and the United Arab Emirates. “The tourism fair is one of the traditional projects for the center,” says project manager Nino Gamrekeli. “Every year, visitors get a feel for what the current trends are in the tourism sector. This year’s exhibition presents the most diverse touristic products compared to previous years,” she said, adding that the visitor can obtain detailed information on interesting touristic destinations. 15.04.2013. This was the title of the closing plenary session at the International Wine Tourism Conference and Workshop in Croatia 2013 (read more here), and was made by the Georgian National Tourism Administration and the Georgian National Wine Agency. They gave an introduction to the wine industry of their country which has the longest history of uninterrupted wine production in the world. While under the Soviet regime emphasis was given to the volume of output, and this on a surface of 150.000 ha, nowadays only 40.000 ha are covered by productive vineyards. Quality of the wine has increased considerably since having lost the Russian market for the past few years and having established a foothold in other markets. The development of wine tourism is one of the key targets of Georgia’s Government which has established an ambitious program of education and training for all manpower involved in the wine tourism industry. For each category of stakeholders, such as restaurant staff, winery staff, tour leaders and managerial staff specific and very detailed criteria have been laid down to ensure competence and professionalism for these people. In addition, the existing wine festivals will receive support and further development. The highlight of the presentation was the announcement that Georgia will be the host country for next year’s (2014) International Wine Tourism Conference. The auditorium responded spontaneously by applauding this announcement. See you there in 2014! 11.04.2013 (HTN - Hvino Tour News). Georgia cannot live thanks to tourism only, - Prime Minister Bidzina Ivanishvili stated during a meeting with the editors of television channels and printed medias on April 10. In his words, he doesn't agree with the previous government's "obsession" that tourism will save our country. 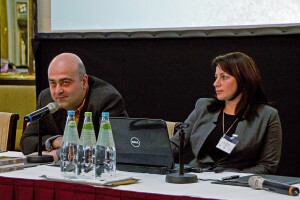 "Tourism will be one of business directions, and not the core as the previous government considered," - Ivanishvili said. 08.04.2013. The number of Polish tourists visiting Georgia increased by 94 percent in 2013 compared to the same period of 2012, according to the Georgian Tourism Association. About 21,000 Polish tourists visited Georgia in 2012. The majority of them visited the country in the summer. An increase was observed compared to 2011 as well, when just 12,103 polish tourists visited Georgia, according to the National Statistics Office of Georgia. In total 5,053,046 people arrived in Georgia that year. Among them, 2,233,589 were citizens of Georgia and 2,819,457 - the citizens of other countries. The number of tourists that have visited Tbilisi from Poland since January 2013 is 634. 05.04.2013. Canada's Department of Foreign Affairs has recently published travel recommendations for the world's countries. The first category is those countries that are inadvisable to visit at all. The second category is those countries that are not recommended unless there is an urgent need. The third category is countries which are generally safe to travel in except for certain territories. The fourth is those countries where tourists should take certain safety measures, and fifth category is those countries where traveling is very safe. Georgia is in the third group together with Russia, Turkey, Armenia and Azerbaijan. According to the Canadian Foreign Ministry's list the U.S.A. Chile, Australia, New Zealand and South Korea are among the safest countries to visit in the world. 05.04.2013. A few shots of the national drink allow travellers to gaze on Tbilisi with fresh eyes. Our guide, Lasha, couldn't find any other words: "Have a couple shots," he kept saying with a wry smile, "and you'll be set." All afternoon, Lasha's attempts to describe the taste, strength and effects of chacha – Georgia's national spirit – had left us intrigued. We had spent the day touring the picturesque south Caucasian country, known for its majestic peaks, savoury cuisine and the hospitality of its locals. And Lasha, naturally, served as our source for all matters of local history and culture. But whenever the conversation turned toward chacha, a predominantly grape-based liquor reputed for its flavour and strength, he seemed at a loss for words. So in the evening, as we headed back towards the capital of Tbilisi, a forlorn, roadside mess hut caught our attention. "Maybe they have it," Lasha wondered aloud as we pulled over.